Why do you take photos? There are probably a million different reasons for this. For me the key ones are to create a record of a place, situation or a moment and then share it with others. The sharing of photos is really important to me since most of my family lives on the other side of the world. Digital cameras and camera phones have fundamentally changed the way we take and share photos. I believe that for the most part this change has been for the better, and digital photography has made photo taking available to a much larger audience than ever before. However I can’t help but feel that we’ve gotten a bit sidetracked in our obsession with megapixels, smile detection features and sepia filters. 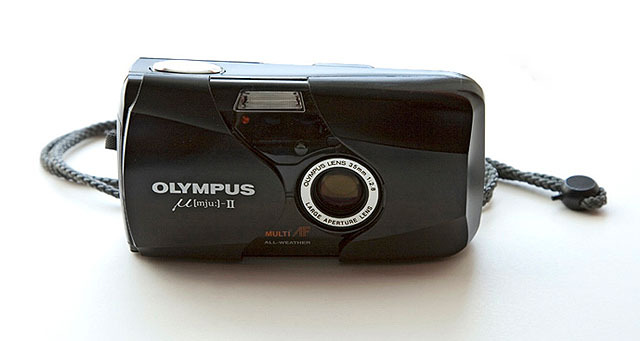 My mum used to have a compact 35mm film camera – you know the simple point-and-shoot type with an on-off switch, shutter, autofocus, flash and nothing more. Every so often she took the roll of film to the photo shop in town to get the photos developed. Soon she could pick up paper prints of the photos and sometimes I received a set, too. That was awesome. Well, the film camera eventually gave up the ghost and mum now has a digital one. Mum doesn’t really like it though, the screen’s a bit hard to see and there’s too many buttons to worry about. She still takes some photos but rarely sees them again – they just seem to end up forgotten in the digital wasteland of the memory card. And I don’t receive photos anymore, which makes me a sad panda. There are heaps of advantages to digital photography over traditional film, I am not arguing that or suggesting that we should return to the old analogue ways. However, there’s also a downside to digital photography that few seem interested in talking about. Digital cameras are physically too complex to use. Compare mum’s old 35mm (on-off, shutter, flash) to my Ixus 60: photo/movie/review toggle, print direct, five-way menu controller, display button and a menu button. The sheer number of physical controls means that you can’t learn to use it overnight unless you have prior experience using digital cameras. Digital camera software is too complex to use. My Ixus has multiple shooting modes, three tabs of menus with half a dozen or more settings per tab, not to mention all the things you can adjust in manual mode. Mum’s 35mm had no menus at all. Connecting digital camera to a computer is not easy. Turn on the laptop and the camera, find the right cable, open a flimsy cover, plug in one end, find the right port in the laptop, plug in the other end, and hope that both ends recognise each other. Alternatively you can play around with a memory card reader and do the oh-so-fun open/eject/insert/copy/eject/insert/close juggle. Getting photos off a digital camera is a pain. The sheer number of options available for accessing and copying photos off your camera is intimidating. Windows users quickly become familiar with AutoPlay and “Open folder to view files”, and on the Mac Image Capture is the default option, like it or not. You are then left with Windows Explorer or Finder to organise your photos – listed along with all the other files and folders in the system. Organising and sharing digital photos requires additional software. Sure, there are good solutions available out there like Picasa, iPhoto, Photoshop Elements, ACDSee and Windows Live Photo Gallery. However more software = more features, options and settings = more things to learn and master. Digital cameras encourage us to take too many photos. Digital photos are said to have “minimal ongoing costs for those wishing to capture hundreds of photographs”. The real cost is no longer that of getting prints however, it’s an attention cost, the cost of time we spend shifting through those thousands of photos trying to organise, select, manipulate, upload and find them. In a strange way, having to pay 15 cents per print was actually a good thing back in the days of film, as it gently forced us to only take photos of the things that are important. Digital photography absolutely requires good computer skills. I think this is the killer – it’s the equivalent of expecting every 35mm camera user to be able to develop their own film. Young people know everything about files, folders, image formats, resizing, uploading, sharing and linking because they’ve grown up surrounded by technology. Mum didn’t, she’s not technology savvy, and doesn’t want to be. Would it do her good to learn some more about computers and the internet? Probably yes. Should good computer skills be a mandatory pre-requisite for taking and sharing photos today? I don’t think so. Whilst digital photography has made photo-taking and sharing easier for the initiated it has also added extra complexity at almost every level. In many ways it has made photography harder for people who once happily took photos with their 35mm compact film cameras and neatly organised the family portraits into physical albums, still perfectly accessible after decades on the bookshelf. If blame is laid it’s not with the camera users but with us – the designers, engineers and product managers in consumer electronics and information technology. However it doesn’t have to be this way, and I can envision ways we can address many the above issues through clever, deceivingly simple design solutions and provide a better digital photography experience for the layman. Eye-Fi Connect, a wireless memory card that automatically transfers photos to your computer and organises them. Thanks to Chris and Leeanne for commenting drafts of this post. Hi Daphne, yes indeed. For instance the overall photo taking and sharing experience on the iPhone is far superior to anything I’ve seen on a personal computer. This seems to translate directly into a change of preference for a lot of people, too. This was recently published in The Age: Shuttered: are the camera’s days numbered? with some very interesting statistics from Flickr. Unfortunately the iPhone is an overkill for just taking photos, from both functionality and price perspectives.